The issue regarding people picking tortoises up from roads and taking them home, is an age-old one, because of what I call, the "ag-shame"-factor. Tortoises and chameleons unfortunately have this "thing" about them that people always want to "take care" of them, doing more harm than good in reality. I firmly believe the main reason why people, while speeding along the N1 from Cape Town to Johannesburg or vice versa, would stop and pick up tortoises on the road (which haven't been run over yet! 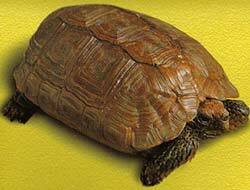 ), is exactly because they think: Ag, shame, look at the poor, lonely tortoise! He must be lost and we must save him. Therefore, we stop and pick the tortoise up and then: Oh, daddy, can we take the poor tortoise home, pleeeez? He looks so sad and lonely! Ag ja jong, bring the tortoise, we'll take him home and give him a good home. Not long after this, Tortoise starts looking ill and thin (having been on a lettuce diet for two weeks, because we heard that this is what tortoises love), so we decide that the best thing for it is to get it back in nature, so we take Tortoise to the closest piece of veld and release him, and say proudly to our friends: Look, we have done our bit for conservation!! In the meantime, Tortoise, who grew up in the Karoo, now finds himself in the bushveld or grassland and can't find anything to eat really (there's just grass around and no lekker succulent bossies to chew on! ), gets sicker and sicker, gets a runny nose because he is stressed out of his shell, meets another tortoise, transfers the runny nose syndrome virus to his new friend and eventually slowly starves to death. Meanwhile, runny nose syndrome spreads like wildfire in the otherwise healthy local population, and before long, Gauteng nature conservators are confronted with serious losses in the local tortoise population. Okay, if you've read this far, pardon me, I tend to get carried away a bit sometimes!! Seriously though, this is just a popular version of exactly what happens when people pick these animals up along the roads and take them home. What they don't realise is that wild animals need special attention if and when you want to place them in captivity, and because not many people know how to care for animals such as tortoises, the animals are usually at the short end of the stick. First, for heaven's sake!!! The animal is not lost or lonely! There just happens to be a road in its way while trying to get to a neighbouring piece of veld and its just busy doing what tortoises normally do, and that is wander through the veld in search of a good meal or shelter or a mate! Therefore, the kindest favour you can do a tortoise crossing the road, is to pick him up, and put him in the veld on the side of the road in the direction it was travelling. Secondly, immediately when you pick a tortoise up and turn it over to see its tummy (because that's what we were taught to do), it urinates, loosing precious moisture, which during the dry season for example, has been saved and stored by the animal and which may have to carry it over to the next rainy season. So even if you put it back in the veld, its health may have been compromised. When you place wild animals such as wild-caught tortoises in captivity and can't supply it with sufficient facilities and proper care, the animal comes under stress, which causes natural, and normally dormant, disease agents, such as viruses, bacteria, internal parasites and even disease vectors like ticks, to become "bold" and which inevitably leads to disease. When you do your "good deed" by releasing the animal to "save" it, you are actually infecting your local and resident (in this case) tortoise population with foreign disease agents, which could have disastrous effects on the local fauna. Finally, even if the animal survives all of the above, by placing non-local animals into local populations, one runs the risk of genetically contaminating resident populations, for example if you take Western Cape angulate tortoises to Port Elizabeth and vice versa. This is something that conservation agencies want to avoid since we support the conservation of biodiversity at the landscape, population, species and genetic level. The non-local tortoise may introduce (by mating with local residents) "bad genes" into this otherwise genetically healthy population. I guess I could go on and on, but these are as far as I am concerned the main reasons why people should not pick up tortoises along any road, and certainly avoid running them over, unlike some road users who would deliberately run them over! A final reason why one should not put animals such as tortoises which have been in captivity for a long time, back into nature is among other the fact that it has become used to a regular source of food, water and shelter, and once back in nature, it would find it very difficult to cope with the harsh reality of less food, very little water (if any), predators, etc. One is actually signing its death warrant! Porcupines can move rapidly backwards to embed quills into an enemy.